Our MediSafe OSHA Compliance Program is designed specifically for the healthcare industry. Are you aware medical OHSA inspectors have the authority to fine you up to $70,000 on the spot for non-compliance? What you will do if an OSHA inspector visits your office unannounced? The fundamentals of employee training? How to keep adequate and accurate records? Are you aware of exposure determinations? Everything a medical or dental practice needs for easy, stress-free OSHA compliance.See reverse for product details. Three cost effective turnkey programs to guarantee medical OSHA compliance for every medical and dental office. 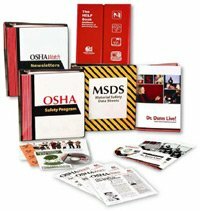 Policies and procedures for all OSHA regulations that apply to medical practices organized under 12 tabbed sections, copies of the regulations, forms and a CD-ROM to customize them into MS Word, OSHA-compliance checklist and more. The basis of your facility’s OSHA compliance plan, including safety sharps requirements included in Manual above. With a master hazardous substance list and A-Z alphabetized tabs. * Computer based training for up to 500 employees. Pricing will vary for organizations with 500 or more employees. ** For GOLD level subscribers, select one online training course all employees will take, a new course may be selected each year. *** In lieu of the on-site inspection and retraining, PLATINUM level subscribers may select 5 online training courses per year for their employees. If online training is desired in addition to an on-site inspection and retraining, please call for pricing.